Prompted by the Top Chef Masters i started to watch other food shows on TV. And the interesting thing happened: some dishes looked so delicious that i felt compelled to recreate them at home. Like queso fundido burgers i raved all over this blog about. Or those angry mussels from The Best Thing i Ever Ate. 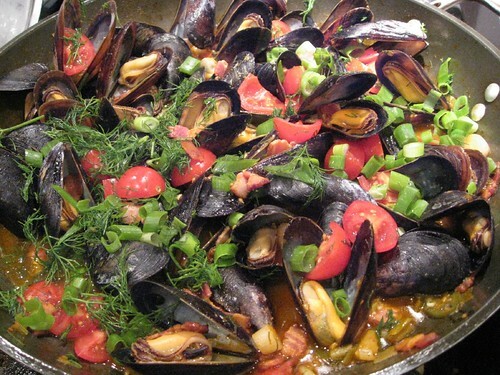 I cook mussels a lot and always in the look out for interesting dishes. The idea to cook them with bacon is of course not novel but somehow the whole thing, name including, looked irresistible. For the dinner tonight the idea was to build the meal around the home-made ketchup, and angry mussels sounded like a good theme to play with. Well, mussels got very angry (and incredibly tasty) being roasted with bacon, jalapeno, scallions, dill, tomatoes, white wine and ketchup. So who said that TV dinners are bad for you?